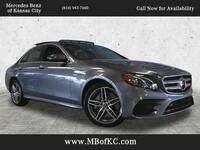 Drivers looking for a midsize luxury sedan with new enhancements for 2019 may be interested in the 2019 Mercedes-Benz E-Class in Kansas City MO. This vehicle is available with several new advantages for the model year whether car shoppers choose the sedan, coupe, cabriolet, or wagon body style. Those with a craving for premium speed and performance can also enjoy AMG® models with high engine outputs and new standard handling enhancements. Some features like a 12.3-inch digital instrument cluster, a powered sunshade in the rear window, and a head-up display will now be available as stand-alone options on many models, while drivers will also benefit from an upgraded steering wheel with Touch Control Buttons designed to offer more immediate control of various systems. New styling highlights (like 19-inch AMG® Twin five-spoke wheels on the Night Package or newly available Brown Ash and Burl Walnut wood trim) will also delight discerning shoppers. The 2019 Mercedes-Benz E-Class in Kansas City MO will be available in several model styles, each of which will offer its own capabilities and features. A new 2019 Mercedes-AMG® E 53 model will be available in sedan, coupe and convertible body styles with a 3.0-liter inline six-cylinder turbocharged engine rated for 429 horsepower and 384 pound-feet of torque (with additional output available in limited bursts with EQ Boost). The AMG® E 63 S model will return as well for those seeking premium V-8 power. The 2019 Mercedes-Benz E 300 sedan will return with a 2.0-liter four-cylinder turbocharged engine offering 241 horsepower, 273 pound-feet of torque, and plenty of attractive luxury amenities. Moving to the second level model brings some powertrain enhancements. Last year’s E 400 model will be renamed as the 2019 Mercedes-Benz E 450. It will keep the previous years 3.0-liter V-6 biturbo powertrain, but the engine output will be increasing to 362 horsepower and 369 pound-feet of torque. That is up from the 329 horsepower and 354 pound-feet of torque in the previous year. Luxury shoppers interested in this model will be able to enjoy it in coupe, cabriolet, sedan, and wagon body styles. 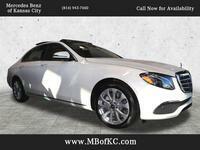 Are you interested in learning more about one of these bold 2019 E-Class models in the Kansas City area? 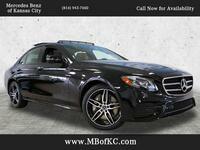 Contact a Mercedes-Benz of Kansas City representative or request more information below. Interested in a 2019 Mercedes-Benz E-Class?